We have had such a nice weekend. Friday night we just hung out at home and relaxed. It was nice to have nothing on the agenda. Saturday we got up late, cleaned house and worked out. We had a really great date night last night. They just built Ruth Chris here recently. I've never been to one before. It was very good! We both got steaks but we were good and got steamed spinach and mushrooms to go with them. Then we went and saw "21" which was very good. It was fun to go to the movies. We don't do that enough! Today we had church (which was so good) and then we went to Applebee's. 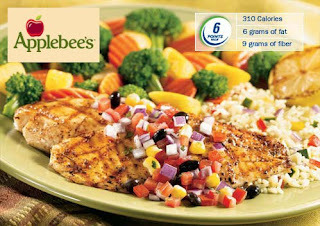 We are not big fans of Applebee's but they have weight watcher meals and they are pretty good. I had the above tilapia and it was only 6 points. Yeay! I'll give you a report tomorrow on how I am doing! This afternoon we did something we have put off for a while but is well needed. We took inventory of everything in our house and took pictures of everything and documented everything including approximate worth and serial #'s in a spreadsheet we will upload to an off-site data file. This way if anything ever happens - fire, tornado, flood ........we will be prepared for our insurance company. I think this is very important to do and if you haven't thought about it before - you just never know what could happen. Cute bag! We went to see Leatherheads last night--we were trying to decide between that and 21. Leatherheads was really good--we laughed a lot (that's usually how I decide if I like a movie or not). P.S. Congratulations to Scott on his great review, too! How nice that they sent y'all to dinner! I WANT THAT BAG!!!!!!!!!!! It's my favorite colors! I'm SOOO JEALOUS!!!!!!! I love the bag, and I wish I was eating that dinner, and I want to see that movie! What a great boss!!! I LOVE that tote... It will be PERFECT for the beach! yumm my mouth is watering thinking of Chris'...Knowing me, instead of the spinach, I would have gotten the potatoes au gratin:)great job finding that bad on bay..what a steal! Hope you are having a great weekend! Didn't you love Ruth's Chris?? I love a good steak! The bag you are taking to Hawaii is adorable! What a great buy. hi again! thanks for visiting my Fiesta. *I worked at Ruth's Chris years ago as a hostess so I always got their early for my shift for the free loaded baked potatoes! Yum! *I started WW almost 2 years ago after I had my second baby. I lost 25lbs and have managed to keep it off. I really enjoyed WW. The tilapia at Applebees is yummy! You can't beat 6 points for a restaurant meal! *Cute tote!! It would make a super cute and practical diaper bag down the road. *I stinkin love eBay! You can find anything on there! *Great idea about photographic documentation for insurance. I need to do that. One of these weekends! I always love checking in to see where you have eaten! it makes me so jealous :) we have Mcdonald's here. gag. We went and saw 21 today too! It was great! I too love the bag and RChris is so yummy. We went in SEA several times. We've eaten at Ruth Chris a few times and love it. My husband and I are also on WW. We both stayed the same this week. Sort of disappointing but we will keep trying. I love that bag and of course clicked on the link and had a great time browsing. Cold here too I think it is 44 yet three days ago it was 78. Go figure! I love that bag! It will be perfect for your trip. I have really been wanting to go to Ruth Chris. Looks delicious. I'm with you...where is the spring weather!?!?!?! I am tired of it being cold! That bag is so cute! It will be perfect for your trip! The bag is awesome! Love that you got it for such a steal! Chad wants to see that movie, so maybe we'll have to go after your good review. Glad you had a great weekend! Glad you had a good weekend, Kelly! Sounds like a great weekend!! And I reallly adore that new bag. Too cute! I love Ruth's Chris! Next time I go, which is rare, I definitely need to try that dessert! that dessert looked soooooo yummy, and the bag even yummier!!! Thanks for sharing, I can't wait for the niceness of spring to show up either! Should anything every happen, you'll be thankful you took an inventory of your home. My husband's parents lost everything in a fire when he was about 6. Love the bag. I know have my eye on that brown zebra/pink cosmetic bag. Too cute! Sounds like a great weekend!!! How lucky to have work pick up that Ruth's Chris tab and what a steal on the bag!!! I love the bag, I just ordered the LL Bean bag that you put your name on. Kind of boring but we have "lost" so many bags when we get with Jerrame's family and since we don't have the same last name,(step dads side) I got WOOD put on it in all caps. Maybe now when I say thats my bag they will believe me. We were going to see 21 last weekend but I decided to go shopping instead. ooooooooooooooooooooooooo that steak in calling my name girl!!!!! it looks so big and juicy!!! I love red meat!!!!!!! That was so nice of them to treat yall. wow!!! ok.....can't wait to see what you choose for your top 3 scents to wear!!!!!!!!! !um your count down says 3 weeks and 3 days......oh how i am going to be so jealous sitting in class while you are in hawaii!!!!!!!! Love Ruth's Chris!! That dessert is making me sooo hungry! Love that bag! Isn't Ebay the best? When I want something really bad but don't want to pay full price, I always hit Ebay up first, to see if they have it! the chocolate explosion made me very hungy!!!! You go girl! Glad ya'll had a great weekend! That steak looks delicious! Love the bag, very cute. We need to inventory the house, too. Definitely need to do that! It looks like you had a great weekend! It was cold here this weekend, too. It even snowed on Saturday. But, today it's in the 50s, so I guess I can't complain! Good for you guys for documenting everything in your home. I can't stress the importance of doing that enough. The only other thing that is equally important is making sure you have adequate insurance for everything you own. It's so easy to have more stuff than you think you do. And, watch your homeowners exlcusions to make sure your policy covers things like jewelry or firearms, etc. Sometimes, you need special coverage or riders for those things! I love Ruth's Chris! We have been there for anniversaries! 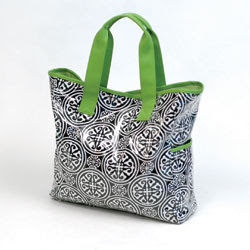 And the bag is adorable and perfect for summer travel! I love the bag!! Cute colors :) good job on the steal from ebay! Also for the inventory, you might add the date and where you purchased them. I know the insurance company wanted that for Bobby's claim from the break-in. I love the bag you bought for the trip!!! Toooooo CUTE! I wished more places had weight waters on their menu!!!! I've been wanting to try the tilapia at applebees!